Imatinib treatment has been very successful in gastrointestinal stromal tumour (GIST), where an initial treatment response is seen for the majority of the patients. 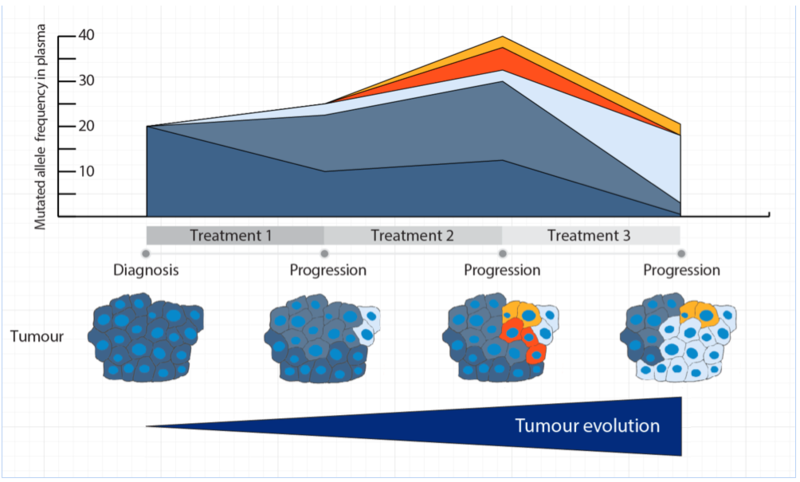 However, over time the tumours evolve and get resistant to the treatment. GISTs are characterised by mutations in tyrosine kinase receptors KIT and PDGFRA, which are important for treatment decisions. There is a need to establish patient-friendly means/methods to obtain tumour material for mutational testing, which can ultimately improve the treatment of GIST patients. In a recent article in Molecular Cancer Therapeutics, Namløs, Boye, Meza-Zepeda and colleagues report the use of blood samples (“liquid biopsies”) for mutational testing of tumours in a large GIST patient cohort. The blood samples contained cell-free DNA (ctDNA) which was released from the tumour into the blood. For all patients with metastatic disease, mutated KIT and PDGFRA could be detected in ctDNA using targeted next-generation sequencing. The mutations were more frequently detected in patients with larger tumour burden, being this the most important detection determinant. Analysis of blood from a patient on imatinib treatment revealed that multiple resistant mutations could be found at the time of disease progression. Detailed analysis of tumour tissue showed that the mutations were spatially distributed in the primary tumour, and that a more comprehensive picture of the tumour was seen when blood samples were used rather than traditional biopsies. Finally, the authors showed that blood samples collected throughout the course of treatment can be used to monitor how the tumour evolves and acquires resistance over time. These findings support the use of blood samples as a source for mutational testing of GISTs, and to guide treatment decisions during progression. Non-invasive detection of ctDNA reveals intratumour heterogeneity and is associated with tumour burden in gastrointestinal stromal tumour. Namløs HM, Boye K, Mishkin SJ, Barøy T, Lorenz S, Bjerkehagen B, Stratford EW, Munthe E, Kudlow BA, Myklebost O, Meza-Zepeda LA.